We appreciate your comments and will respond as rapidly as possible. Be assured your name, address, etc. will be protected and used only by the Spencer Art Gallery. Yes, we do ship artwork on approval. Return shipment must be guaranteed by the buyer. Call for details. Yes, we have a lay-away program. We can arrange a lay-away for flexible periods to suit your desires and needs. For special appointments and private showings, call the Spencers (843) 886-6617. Hours: Monday - Saturday: 10 a.m. - 5 p.m. 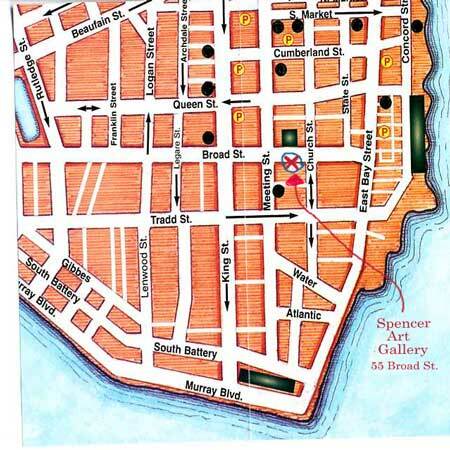 The Spencer Art Galleries are located at 55 & 57 Broad Street, between Meeting and Church Streets in the heart of Charleston's historic, French Quarter district.